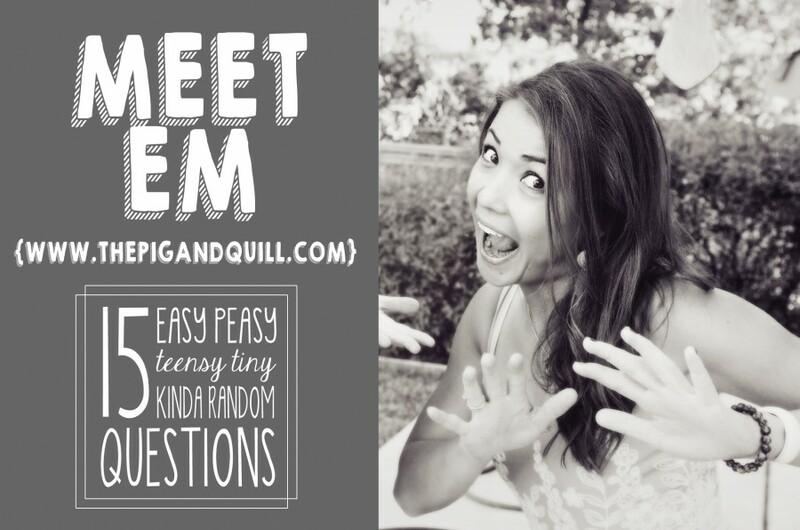 So…Let's Hang Out – The #SoLetsPigOut Summer Potluck Kickoff + Sticky BBQ Korean Chicken Wings + A Giveaway From Mighty Nest! 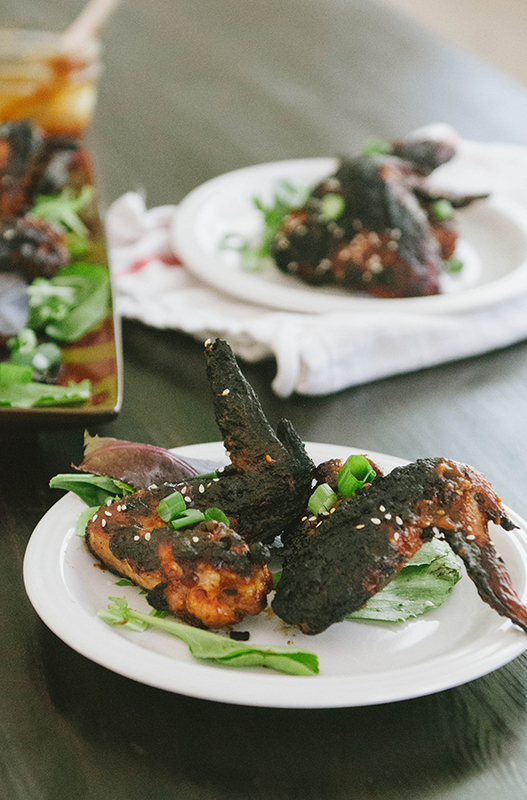 The #SoLetsPigOut Summer Potluck Kickoff + Sticky BBQ Korean Chicken Wings + A Giveaway From Mighty Nest! I also want you to be able to get to know our lovely week-long co-host, so we’ve both concocted a couple of professional standard kinda-random but oh-so-telling interview questions for each other. To skip to Emily’s interview CLICK HERE. You can find my answers to these questions over on her page HERE. 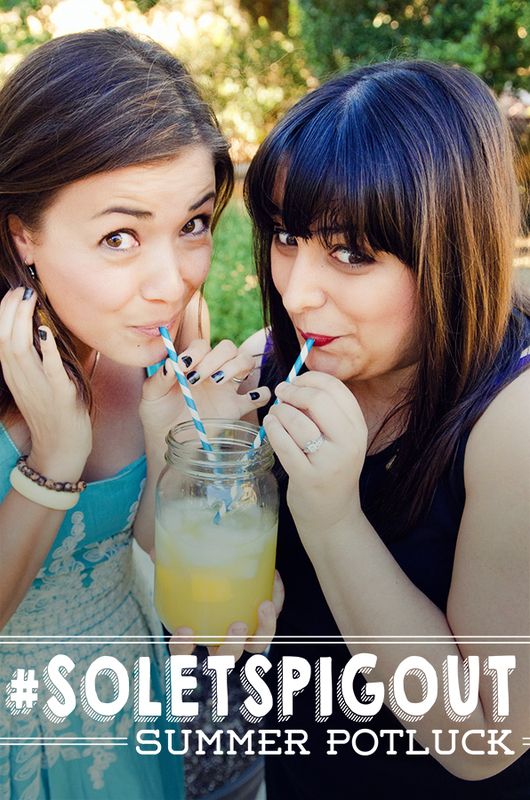 So we’ve put together a week long event called the #SoLetsPigOutPotluck (see what we did there? I know–clever). It’s a celebration of summer where we’ll be sharing a collaboration of recipes we’ve made just for you, as well as giving away some fun prizes from great brands. 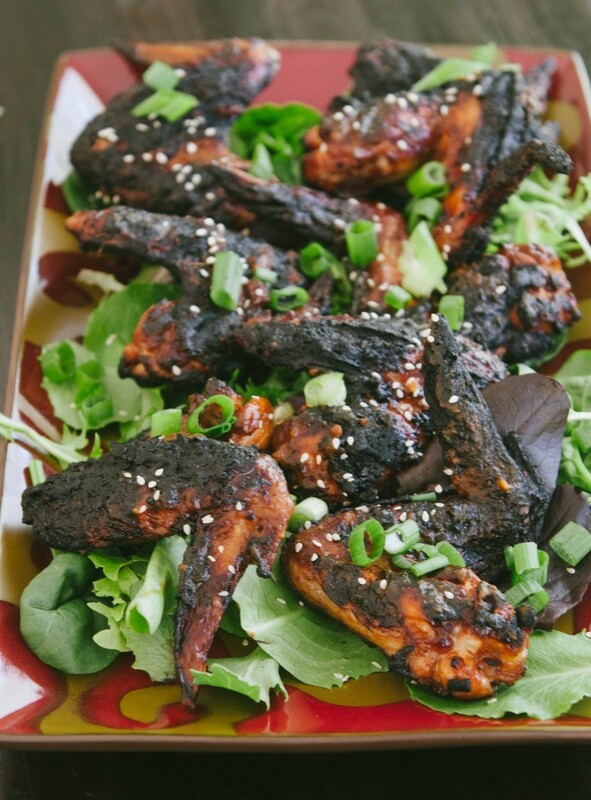 For example, not only is there a recipe for some crazy delicious wings today, but you can also enter to win $225 worth of prizes from Mighty Nest! Now..if we’re honest, this potluck idea mostly came to pass because we wanted a reason to get together, cook until we’re loopy, drink summery things, laugh until our sides hurt, and shove wings in our face like no one was watching. I just spaced out for a second while typing this, thinking of those Sticky BBQ Korean Chicken Wings from that fateful day. To say I have craved them every single day since our get together is maybe a bit of an exactly-right-not-even-kind-of-an-under- statement. Look at these babies. Hello, beautiful. Also, what happens when you want to call a wing a “wang” (you know, with a southern accent kind of thaang) but you don’t want to actually type out “wang”… because, well… you know. This is my dilemma: I would like to be able to type CHICKEN WAAAAANG without it seeming pervy or feeling all kinds of weird about it. I don’t think this is possible. Boo. Can’t win ’em all. However, we can both attest to the fact that these wings are a big fat WIN! When I think about Korean chicken, I think about my Grammie’s deep fried version. She plunges chicken into bubbling oil and gets it all crispy and then lets it sit in a spicy sauce. It’s delicious! However, I wanted to create a healthier option that packed the same kind of flavor punch. During my get together with Em, I was still participating in my Whole 30. It was towards the end, but we still did our best to make everything we ate as Whole 30 friendly as possible. That means these wings are pretty darn figure friendly! They are marinated overnight in a slightly modified version of my Grammie’s sauce recipe. They are then grilled (this is where the heat from the 98 degree day merged with my brow sweat and gave me sweaty bangs—not great). While they are grilling and getting crispy they are basted with a sticky sauce! This sauce has all the flavors of the marinade but is thickened with dates for some sticky-finger lickin’ sweetness. I might have eaten the entire plate. Let’s just say no one is going to be mad at these if you were to bring them to a summer potluck. To get the recipe for these sticky little wing-ys, you can scroll down to the bottom of the page or just click HERE. Alight folks, are you ready to get to know Em? We’re taking on some hard-hitting issues like spirit animals and 90’s music! Let’s do it! 1) What inspired you to start The Pig & Quill? I’ve been cooking at home for as long as I can remember, mostly off-the-cuff dishes that we’d maybe revisit a time or two before I’d get bored and find something new I could enhance with Spam. I never documented a thing, which made it tricky on the few occasions when someone would ask for a recipe. At the same time, I’d been an avid reader of food blogs for a few years and was constantly awed by the voices behind them. And the creativity! Food is ultimately about so much more than just putting stuff in your mouth (although yay!) or sharing a list of ingredients that make a meal (although also yay!). It’s a medium of communication — and in the blogging world, in particular, there’s this lively sense of community that just draws you in. It’s magnetic and completely engrossing. Adding my voice to that mix is one of the biggest leaps I’ve ever made, and I still don’t feel like I’ve completely found my footing. But if nothing else, it’s an excuse to get those recipes down on paper. And something to pass the time when Vampire Diaries is between seasons. 2) If you could have dinner with ANY three people, who would they be and why? They can be living, dead, fictional, holograms, cartoons– it’s a fantasy. First would most definitely be my mom’s mom and dad, my Paw Paw and Goong Goong. They both passed on before they could witness for themselves just how largely they’ve influenced my adult life — Paw Paw in my closet and Goong Goong in my kitchen. I’d also give anything for them to meet Chris (←hubs), and vice versa. I’ve told him the apples (or rather the sharp tongues) don’t fall far in this family, but I still think he’d be shockaroo’d. Wait, does that mean Chris is my third? Oh, he doesn’t count? Ok cool. Because I totally want my momma there, too. 3) What’s your spirit animal? I was born in the Year of the Boar, my nickname growing up was Pork, my blog is rather porcine in title, so I’m gonna go with the good ol’ Water Buffalo. Because WaBuff should be a thing. Like wahBUUUFF! Can’t you hear it? I feel a Stomp the Yard sequel coming on, and I like it. And also: mozzarella. 4) If you only had three words to describe yourself what would they be? 5) When you were in middle school, did you wear too much body spray too? Because, I smelled like a baby cake factory doused in patchouli and cucumber melons. If not, describe your middle school self. Were there overall jean shorts involved? 6) Do you consider yourself an introvert or an extrovert? Ok, so oddly, I can be kind of a wallflower when I’m in a room full of strangers, but if I’ve got a buffer of friends, I’m easily the goofy, kind of underdressed one that’s dancing like nobody’s watching. Wife beaters are cool in the club, right? Oh god, I think I just realized I’m that friend. 7) If you could only eat one thing every day for the rest of your life, what would be? Whoa, why so dark? Jeebus, Gina. Ummm, ikura-don with a side of something pickled. Or porky ramen? Definitely something Asian with a high sodium quotient. 8) What’s your least favorite food? Thick, herby ranch dressing. But I can eat the cheap, watery stuff from a Sysco Foods can allll day long. Because that’s totally something you want to hear from a recipe developer. 9) What’s your blogging process like? I wanna spy on you making gnocchi. First of all, if you want to spy on me making anything besides a big honkin’ mess, you’ll have to do it from outside, because — as you know firsthand — my kitchen is about → this ← big. 10) It’s 1996. We’re going to have a sleepover. What are we going to do? Nails, Tiger Beat, redial KSFM 102.5 until we can request Pony for “all the boys with saddles waiting.” OMGTHATSONGISSODIRTY. I only have one semi-clinical fear, but I’m not even going to talk about it here for fear of the terrorizing emails I might receive. (People can be cruel with those things!) More generally: rejection — in a big, big way. Risk. The idea that I’ve missed an opportunity to live life more fully but don’t have the confidence — or motivation? — to do something about it. And then conversely: trusting blind faith and doing something about it anyway, leaping without looking, that kind of thing. Open water kinda spooks me, too. 12) I’m currently in possession of both your ice cream scoop and your bread pan. On a scale of one to never how likely do you think it is that you’ll get those things back? 13) What 90’s song speaks to your soul? This one. But you already knew that. 14) How would you describe your cooking style? I groove on comfy, accessible, feel-good food that’s more nourishing to my body than it is toxic for the planet. But that’s a bit of a blanket statement to which there are a great number of exceptions. While I do my fair share of gluten-free and vegan stuffs, I’ll rock a box of pudding mix now and again. I like spicy stuffs and fruity dranks. And there’s mosdef a place for bacon in this girl’s belleh. 16) Do you wanna go do karate in the garage? Wait, are you stereotyping me!? GINA! Good job, Em! Thanks for getting real with us. Wanna read my answers? Head on over HERE. Meet you in the garage for karate right after we talk about this bonkers giveaway! 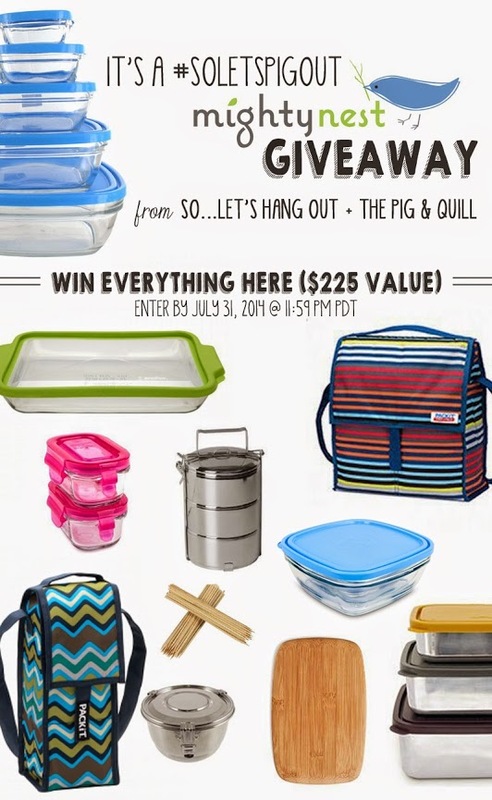 Today’s giveaway is coming from the lovely eco-friendly folks over at Mighty Nest! They believe in high-quality kitchenware that is chemical free! In their words “What sense does it make to commit to high standards in food if the tools you’re using to prepare, serve, and store it are leaching yucky chemicals into your healthy treats?” Yes. Chemicals are a total bummer. So, we’re totally crushing on this SUPER cute yet SUPER safe ultimate potluck set that they’ve put together for one of our lucky readers! Another cool thing about Mighty Nest is their fundraising program! They donate 15% of your purchase to the school of your choice! Pretty neat, right? Before you go crazy trying to win all the things on the Rafflecopter widget below, consider joining the So…Let’s Hang Out Mailing List! I’ll send you weekly updates straight to your inbox. I’ll also update you of sweet giveaways like this one. No spam, just fun! Whisk together all of the items in your marinade until it's well combined. Add your chicken to the marinade and toss well to coat the chicken. Place the chicken and the marinade either in a bowl with a lid or in a large freezer bag to marinate overnight. Once your chicken has marinated over night, it's ready to be grilled. Heat up your grill. 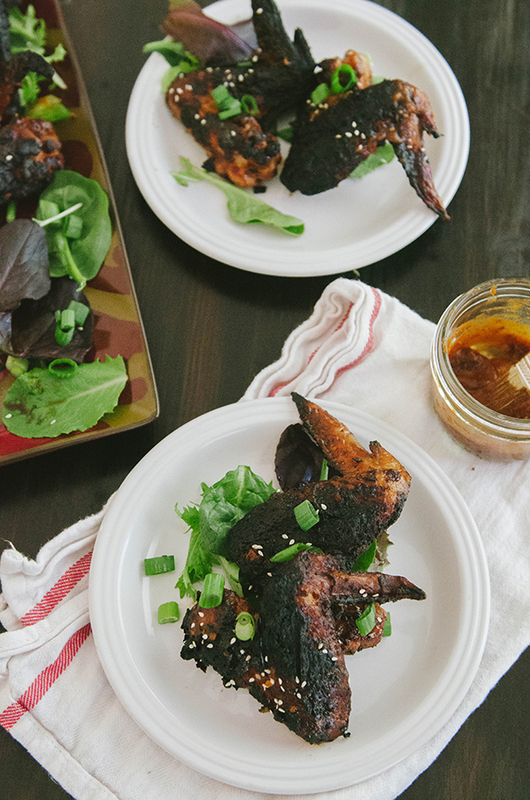 While your grill is heating up, you can make a batch of sticky sauce. Add all of the items for the sticky sauce into a high powered blender and blend together until it is smooth. It should be a little bit sticky to the touch. Once your grill is hot, you can add your wings (skin side down). Make sure that your grill grates have a little bit of oil or non-stick spray on them before you place the wings down. If your wings stick to the grates you will lose the skin (which is totally the best part). Grill for 4-5 minutes per side or until the internal temperature has reached 165 degrees. Baste the wings thoroughly with the sticky sauce while they are still warm. Garnish with extra green onions and sesame seeds. Serve with extra sticky sauce! Enjoy! As a direct participant in shoving those wings in my face, I can’t recommend them enough. Let’s make these again soon! Oh Emily! Love the way you cook, write, make me laugh! Little middle school stripper scent – mine was Love Spell, so sweet so stinky. 😉 That wing sauce tho, so sweet and sticky! I wanna smear it on everything! Super excited about this whole pigout party! Thanks Grace! SO glad to you have you diggin’ the pigout. Can’t wait till you join the party! That picture of you two is the cutest. Thanks so much for organizing this amazing potluck! Can’t wait to try my hand at all these recipes.